Great Lawn: Eight ballfields, restored in 1997. North Meadow: Seven baseball and five softball fields, restored in 2000. Heckscher Ballfields: Located at 63rd Street between the west and center drives. There are six ballfields, restored in 2006. Permits for baseball and softball are issued from mid-April through mid-September. Opening and closing days will be posted. The ballfields may be closed for maintenance or when wet. NYC Parks issues permits to leagues, teams, and other groups to reserve specific athletic fields at specific times. The public can obtain athletic field permits for a session on one of the fields by completing and submitting a permit application to the permit office at the Borough Office (24 West 61st Street). A permit application also can be requested by phone by calling the Permit Office. Members of the public who wish to join or set up a league should call or stop by the permit office as well. For additional information, call the Permit Office at 212.408.0226. 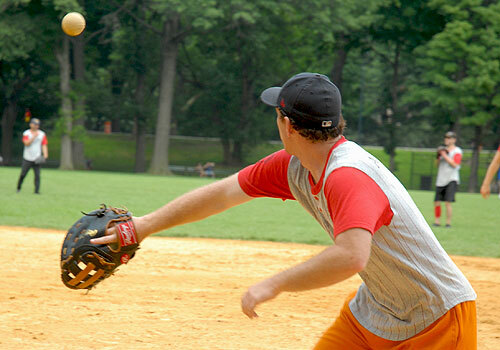 For a list of all ballfields in New York City and permit information, visit the NYC Parks website.